We’d love your help. Let us know what’s wrong with this preview of Thinking Toolbox by Nathaniel Bluedorn. This book is like a toolbox, full of different kinds of tools you can use for different thinking tasks. Just as you use the wrench in a regular tool box to fix the sink, so you can use the tools we give you inthis book to solve thinking problems. -Who has a reason to lie? We wrote this book for children and adults who want to learn logic and critical thinking skills. 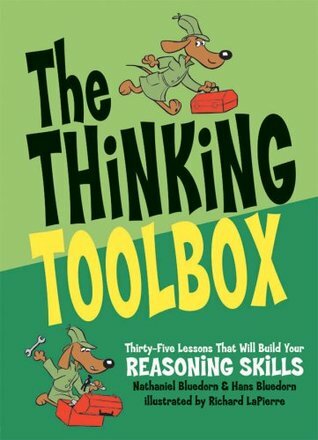 The Thinking Toolbox follows the same style as The Fallacy Detective with lessons and exercises and an answer key in the back. To ask other readers questions about Thinking Toolbox, please sign up. I know the author's other book The Fallacy Detective has a Christian orientation. Is this book similar? Fun and simple book for learning basic thinking tools, logic, etc. Good books to teach children how to think critically and use the scientific method. Hope to use these when we homeschool our children. Also check their "Fallacy Detective" book. I am reading through this (and discussing) with my 11-year-olds. My 7-year-old is sitting in and he's able to understand and answer, so maybe he'll be formally included! They're all really liking the lessons and think they're "funny". I like to watch the little gears in their heads turning. The Bluedorn's books on logic are quite entertaining. Great starter for debate students. Not as fun as The Fallacy Detective, but still quite humorous for a logic textbook. I preferred the more serious and true examples and exercises to the humorous, concocted ones. I think this book would be more suitable for middle-schoolers than high-schoolers. This book was super funny but it was also educational. But all over it was fun to read. This book is so engaging and makes concepts in critical thinking easy to understand for young people. the chapters are nice and short. they are also frequently entertaining. Good companion to "The Fallacy Detective." Most of the info here can be found elsewhere, but the quirky thinking exercises and funny questions are special to this book. I definitely recommend it. This had some great stuff in it. Some of it was just too dorky and some just not that well thought out. I'm glad we read it though. Some interesting thoughts on how to increase logical thinking. Some of it is corny. A bit young for my teens and is probably better geared towards 10-14 years old.